The Lakelands offer extensive travel and touring opportunities. Browse through this page and get a wonderful overview on visiting Birr Castle, Tipperary, the Shannon River, Enniskillen, County Fermanagh, Northern Ireland, the Strokestown Park House and Famine Museum and much more. Maireed Tierney, Owner, Paddy's Bar, Committee Member was on the October 13, 2018 "Travelers411" Radio Show in hour 1. Maireed Tierney was also on the April 28, 2012 "Travelers411" Radio Show in hour 1. 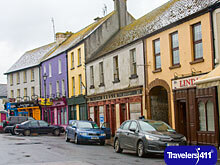 Get an overview of the county Tipperary in Ireland's Lakelands region, a rural area rich in history dating back to the 5th and 6th century, quaint lakeside villages, pubs, shops, restaurants and traditional music. Explore Lough Derg Lake, castles and big houses, the history of Brian Boru High King of Ireland and "the other" Ballina a larger town in the region.